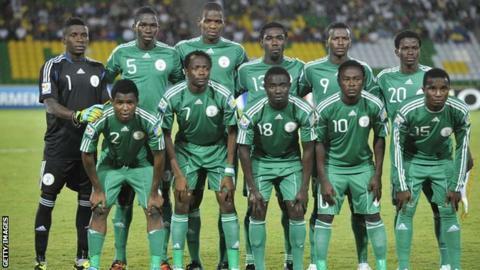 Holders Nigeria beat visiting South Africa 3-1 on Sunday to complete a 4-2 aggregate win and qualify for the 2013 African Under-20 Championship in Algeria. Joining Nigeria and the hosts in the finals are Gabon, Ghana, DR Congo, Mali, Benin and Egypt. The four semi-finalists in Algeria will qualify for the 2013 Under-20 World Cup in Turkey. Nigeria (pictured) reached the quarter-finals of the 2011 edition in Colombia losing to France on penalties. Ghana are the only African side to win the Under-20 World Cup when they beat Brazil on penalties in 2009 final in Egypt. Nigeria's qualification was sealed thanks to two goals from Abduljeleel Ajagun and one from Alhaji Gedo. While Thabani Mthembu's solitary strike proved to be only a consolation for South Africa. "The hot weather here in Nigeria is crazy, but I like the style of play of the Nigerians," South Africa coach Solly Luvhengo said after the match. DR Congo reached the finals with a 4-1 thrashing of Cameroon in Kinshasa on Saturday. It is the first time that a junior side from DR Congo has reached a continental tournament as they overturned a 2-0 deficit from the first leg to win 4-3 on aggregate. National team coach Claude LeRoy and his assistant Sebastien Migne have helped the under-20 technical team. "I fought for this team since the beginning, they risked missing to travel to Mauritius but I insisted with football authorities that they shouldn't let those youths down as they are better team," LeRoy said after the match. "Authorities must provide means for them to prepare for the finals in Algeria, as required." DR Congo Under-20 coach Baudoin Lofombo, who won this year's Kinshasa League title with Rogelu (a club owned by the father of West Bromwich Albion player Romelu Lukaku), was emotional after the match. "I'm proud to be the first Congolese oach to lead DR Congo to the finals for a junior team," he said. "Our qualification is due to my players understanding they should not be thinking of money at this stage, because when they are to the final stage the whole world will be watching them." Gabon beat visiting Burkina Faso 2-0 to complete a 4-2 aggregate victory. Ghana survived a scare in Morocco as they lost 3-1 but still qualified for the finals 5-4 overall. There was a comfortable 3-0 win for Mali over visiting Zambia to complete a 5-2 aggregate victory. Benin advanced to the final with a 1-0 win in Senegal to make it 4-1 on aggregate. Egypt's under-20 side did what their senior side could not and reached a continental tournament after battling to a goalless draw in Angola to complete a 2-1 aggregate win.